This taco truck is awesome. Carmen noticed a few months ago that this truck, parked at the Unocal 76 station at the northwest corner of Venice and La Brea, was attracting big crowds, despite its proximity to the famed El Chato truck. I saw the compelling al pastor spit with my own eyes. I read Bandini’s favorable review of the place. It has been too many weeks since I last had righteous tacos, and I have been craving just that – fancy tacos and weird tacos leave me wanting for righteous tacos, those tight little doses of elegant perfection, where the tortillas are not homemade but oiled and griddled to leatheriness, the meats are savory and diced small, and the salsa is red hot. Celebrating the end of my working week and the arrival of the weekend – tacos are to meals as weekends are to weeks – Carmen and I went up the road to Venice Boulevard. Bandini called this truck Leo’s, but I didn’t notice any name on the truck other than “El Latino” Catering. Furthermore, this truck is clearly different from the one in Bandini’s pictures from a month ago, although everything else matches up, including the staff. No matter – at the moment I am feeling too much calm reverence for this taco truck to pronounce its sainted name aloud. We went to the truck at about 7:00 PM – unlike with the late-opening El Chato truck, there is no need to kill the evening boozing somewhere while waiting to eat tacos. This location on Venice Boulevard is a fine specimen of tacogeography. The absurd width and underdevelopment of this automobile-oriented stretch of Venice Boulevard provides the setting for the adaptive reuse of the edge of an overlarge gas station where half the pumps have been decommissioned. This is a transient, fugitive space, lacking all of the qualities that anyone would use to describe a nice neighborhood; but here crystallizes regularly a temporary community gathered together to share in the eating of righteous food. While you are here, it’s the greatest place on earth. It’s outside, and it’s in and of the city. I ordered two tacos al pastor and one each of the carne asada and the carnitas, a bargain at $1.00 each for average-size tacos. Carmen, knowing something good when she sees it, ordered four al pastor tacos. The serveur directed the carne asada and carnitas orders to the truck, and the al pastor orders to the master of the spit. Carne asada and carnitas were done first – the taquero in the truck called my order and handed me a plate of undecorated tacos, just meat on bilam’d tortillas. The condiment table features the standard items, which without skill I applied to my tacos. The cilantro was diced into tiny bits, an attribute Carmen declared essential to the righteous taco, with which I agree, but I don’t know why it is so. The rojo is quite spicy, the green thick and appropriately herby. The knife-wielding master of the al pastor spit does his work out front of the truck, out in the open. Dozens of pork filets are piled high on the spit in front of what looks like a glowing concrete breeze-block with a fire behind it. Half a pineapple sits on top. When he got the order, the taquero grabbed tortillas, dipped the edge in the puddle of hot oil and drippings beneath the spit, and flung the oil from the tortillas onto his griddle. The tortillas sat there a while, achieving the perfect leatheriness and crispening. For the next step, the taquero scooped up the bilam’d tortillas and with large knife carved slivers of pork directly from the spit into his tortilla hand. The taco full of pork went face-down back on the griddle, to crisp the edges of the meat; and finally before being served, slivers of caramelized pineapple were sliced and placed on top. I garnished these tacos with spicy rojo and eagerly brought my paper plates to the trunk of Carmen’s car. I ate an al pastor taco first. Sweet heaven, this taco was just right, the tortillas perfectly crisped and the al pastor phenomenal. Neither saucy nor dryrubby, the meat was dense with flavor that seemed integral to the meat, both savory and fruity. The excellent pineapple complemented the pork perfectly. Pineapple is underrated, as it is surely the best tasting of all fruits – the al pastor of fruits if you will. 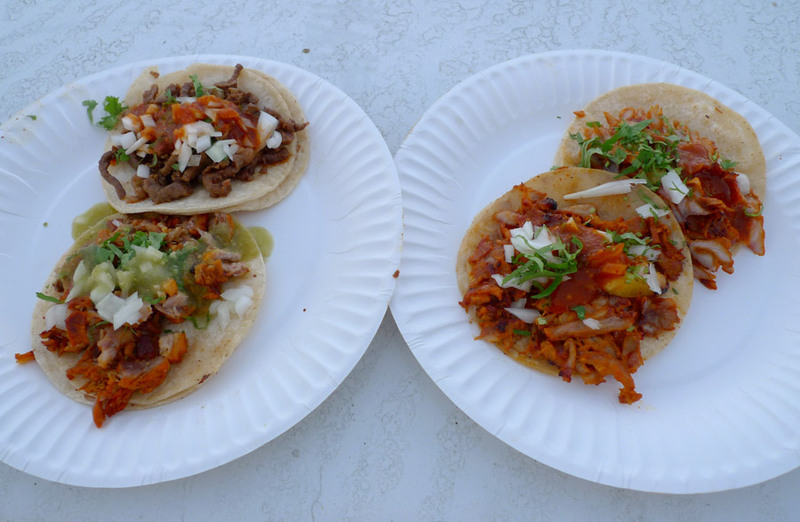 The other tacos were great as well, although it seems unfair to compare them against the al pastor. The splendor of al pastor crowds my brain leaving all other meats forgotten. I almost feel sorry for the taqueros who work in the truck preparing all the non-pastor items, of which they offer a good variety – every day they have to compete against the man with the spit. It’s not their fault. The carne asada was a fine specimen of carne asada, sparely furnished, finely diced and well textured. The spicy rojo perfected this taco. The carnitas, bright orange on its exterior, is striking – when I picked up the plate, Carmen and I both looked at it and said “Ooo!” This taco was the largest – its tortilla-filling handful brought to mind its contrast with the relatively diminutive tacos up the street at El Chato’s. We nibbled and I found that the carnitas had the paradoxical oily lightness of having been just-fried, with strong pork-fat flavor. I chose the green salsa for this one, and greatly enjoyed it, although I must admit that I was distracted by memories of the al pastor taco I just ate and by visions of the second al pastor taco that I was about to eat. I was in taco heaven for quite a few minutes. 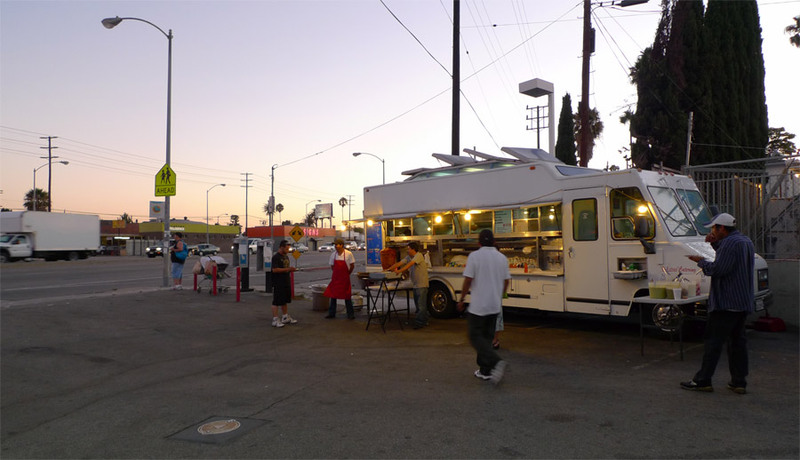 My experience this evening – eating the best meal I’ll have all month, on the trunk of a car parked in a disused gas station as the sun set over Venice Boulevard on a summer evening, for a grand total of four dollars – this for me is what tacos are all about. The euphoria of another awesome taco experience briefly brings meaning and order to the fuckedupness of everyday life. I have an urge to terminate the cincuenta taquerías project and declare it successful and completed, now that I know I have found that everything I need in this world is available at this disused gas station two miles from my home. But I will soldier on, buoyed by the hope that maybe tacos will bring me good fortune yet again.